The hardest part of training is communicating with the dog in a humane way that the dog understands. However, the underlying principle of all communication is simple: reward desired behavior. Our technique never includes harmful physical force or violence. Using force may lead to a loss of drive (enthusiasm for the given task), stress, and in some cases even aggression. I'm Pam Coath, owner of Main Line Dog Training Service, LLC. I am a CPDT-KA (Certified Professional Dog Trainer, knowledge Assessed) with the APDT. Most dogs, no matter what their eventual advanced training or intended purpose, live with people who want them to behave in ways that make them pleasant to be around, keep them safe, and provide for the safety of other people and pets. Dogs do not figure out basic obedience on their own; they must be trained. And we have been successful trainers for over 25 years now. Private, one-on-one lessons in your home, a great way to prepare your puppy for puppy classes later on. AKC and CGC Preparation, in your home (American Kennel Club, Canine Good Citizen) Basic obedience and behavior problem solving for puppies and adult dogs. The main focus in all training is to find ways to reward your dog for doing what is right, and not look for ways to punish him for doing what is wrong. To make training fun and interesting for you and you dog. Pam is pleased to have some of the most reasonable rates in the area! Lessons are one and a half hours in length, at the rate of $110.00 per lesson. Although there are variations, most clients schedule anywhere from one to three lessons, depending on the need and expectations of the client. 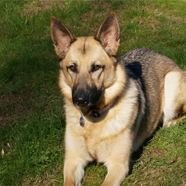 "Pam has done an excellent job in helping my husband and myself learn how to train our dogs. From her first visit our dogs loved her and trusted her. She had them performing basic obedience sit, stay, come faster then we could imagine. She is also great at teaching tricks which everyone gets a kick out of. Pam has a vast knowledge of canine behavior from many years as a trainer. She definitely spends extra time making sure we understand how to work with our dogs and their different personality types. I would highly recommend her to anyone who wants their animals to be obedient and follow the rules of their owners households." 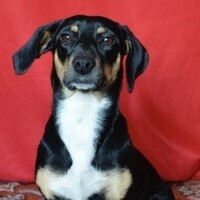 "When I first met Pam, I had recently adopted Sasha, a year-old daschund mix, who had been in two shelters. Sasha was adorable and engaging from the start, but she was also quite anxious about being alone, about meeting new dogs who were larger than she. Since she weighs 22 pounds, that’s a lot of dogs. She had other quirks too: she did not come when called and was a frighteningly good escape artist. And she was only sort of house trained. Thanks to Pam, Sasha is a perfect lady now. She makes friends wherever she goes. She understands verbal and non verbal instructions and knows some tricks too. And she loves her training sessions, whether with me or with Pam." "I’m so glad I found Pam’s website www.MainLineDogs.com . She responded right away to my email and was very positive and helpful. She gave me lots of advice on bringing our new puppy home before we even meet for our first training session! 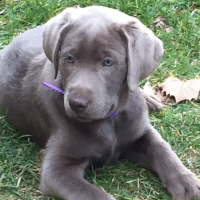 Gracie our lab puppy responded to Pam right away and she was really good at giving us training tips. It was amazing what she was able to teach us, and how well Gracie responded to her methods of positive reinforcement. Gracie had sit, down and roll over commands on Pam’s first visit! Pam is so easy to work with, easy to schedule, and very friendly and professional. I would recommend her to anyone."